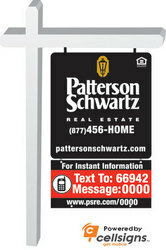 Real estate property information delivered to cell phones by Patterson-Schwartz and mobile solutions company CellSigns. Patterson-Schwartz Real Estate announces that the company has partnered with CellSigns, whose mobile real estate platform provides consumers instant access to property information from their cell phones via text messaging. The service will launch in Delaware, Maryland and Pennsylvania. For a competitive advantage in today's marketplace, real estate agents and brokers need look no further than that most common of consumer tools, the cell phone. With CellSigns, prospective home buyers get comprehensive information about every Patterson-Schwartz listing, including interior photos, features and the listing agent's contact information, simply by sending a text message with the property ID from the lawn sign. "With the use of CellSigns technology, Patterson-Schwartz once again leads the way in adapting to the changing communication habits of today's homebuyer, by providing property information using the consumer's preferred communication tool," said Helen O'Hara, VP Marketing & Technology at Patterson-Schwartz Real Estate. "What makes this so powerful is that it's a listing tool, a buyer's tool, and a branding tool that provides information to consumers in real time, and allows them to get additional information on their cell phone or on the web, from one unique property ID," said Mark Ford, CEO, CellSigns. "The property ID can now be advertised in print, on the web or on a lawn sign, and the message is consistent across all channels. This is not just about delivering property information to consumers; this service maintains the broker's and agent's brand, and ensures the accuracy of the information across all mediums. We are excited to partner with an industry leader like Patterson-Schwartz on this technology, and to provide a powerful service to them and their customers," said Ford. As the only universal mobile platform for the masses, SMS (text messaging) does not require special equipment, since it's already available on over 99% of cell phones. Text Messaging is a breakthrough communication medium, as evidenced by growth year after year. As of August 2007, over 20 billion text messages are sent every month - and that number has grown by 250% each year for the last two years. With the cross-generational utilization of text messaging, it only makes sense that savvy brokers leverage this exciting communication tool. The CellSigns real estate text messaging service and mobile search tools were named the "Most Innovative Real Estate Technology" of the year by Inman News. CellSigns (http://www.cellsigns.com ) is a leading mobile applications company providing interactive solutions for businesses via text messaging, SMS, MMS and WAP. Supported by every major wireless carrier and working on over 99% of all cell phones, the company offers private-label mobile search application, Mobile IDX & Mobile MLS search, click-to-chat, click-to-text, Mobile IM (MIM) applications, customized alerting and the only interactive property marketing service for real estate. CellSigns powers over 1.1 million real estate listings, 1.5 million mobile ads and alerts. Patterson-Schwartz (pattersonschwartz.com]) is the leading real estate company in Delaware with eight offices and 350 full-time Sales Associates. Founded in 1961, Patterson-Schwartz utilizes innovative technology to provide their customers with exceptional real estate guidance and marketing expertise. Patterson-Schwartz offers a full range of services, including residential home sales, purchase and rental; relocation services; property management; and Home-Link® homeowners' services.